I have often heard or read that in Old Shanghai, the business district was in the International Settlement, and the higher class residential in the calmer streets of the French Concession. Although most of it has now disappeared, the International Settlement although had its select residential district. 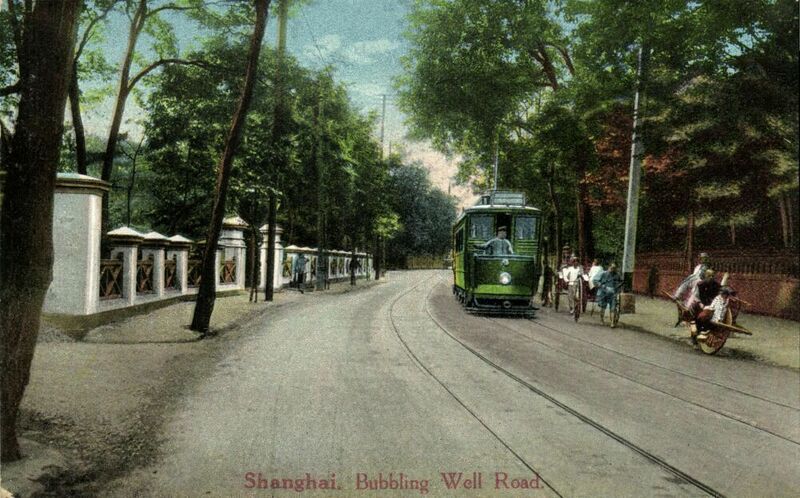 Bubbling Well (today Nanjing Xi lu), was originally a countryside road with large mansion along with their massive gardens on its side, including the former Majestic Hotel. In the 1920s and 1930s, these large properties were sold and new buildings were erected in a much denser fashion. 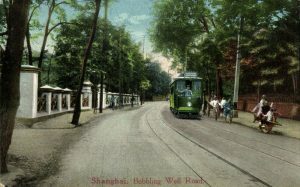 The residential streets moved up North, along Avenue Road (today Beijing Xi Lu). 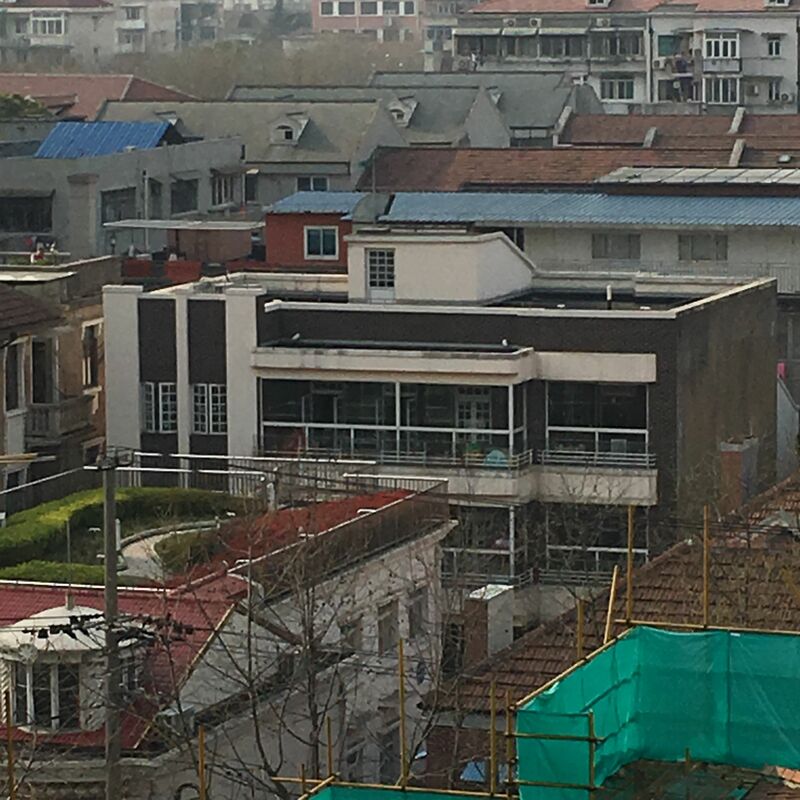 Although this part of Jing An has been massively built over in the last 20 or 30 years, a few villas have resisted in this area, they include the Laszlo Hudec Hu Mansion (the Green house), the former Pei Mansion and a few houses around the corner of today Changde Lu and Beijing Xi Lu. Another street further North with a number of large villas was the Western section of Wuding Lu, although very little information available about them. Large houses seem only to have been in that section of the street as opposed to the (now gone) shikumen and factories that lined the more Eastern section. This stretch of a few hundred meters really feels like other residential streets in the French Concession or around Yu Yuan Lu, making it a pleasant stroll. Although each house is a different style, they all seem to have been built in the 1930s. From a neighboring rooftop, I could see them all and noticed one in particular, an Art Deco mansion, behind a modern school building. Although I could only see part of it, I always thought this house was special. It’s only a few years later, while visiting the Ordinary Metropolis exhibition in 2016, that I discovered the true identity of this house, in a section dedicated to Chinese modernist architects. One of them was American architect Chinese Poy Gum Lee / 李锦沛 (see in-depth article about him on Shanghai Art Deco blog). He worked, among others, on the Chinese YMCA building in Shanghai (today Marcopolo Hotel on people square), on Sun-Yat-Sen memorial in Nanjing and later on buildings in New York’s China Town. I first heard about him during 2015 Shanghai Art Deco World Congress. 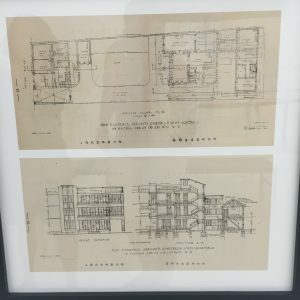 Blue prints of a house designed by him were used as an example of Chinese modern design in the exhibition. 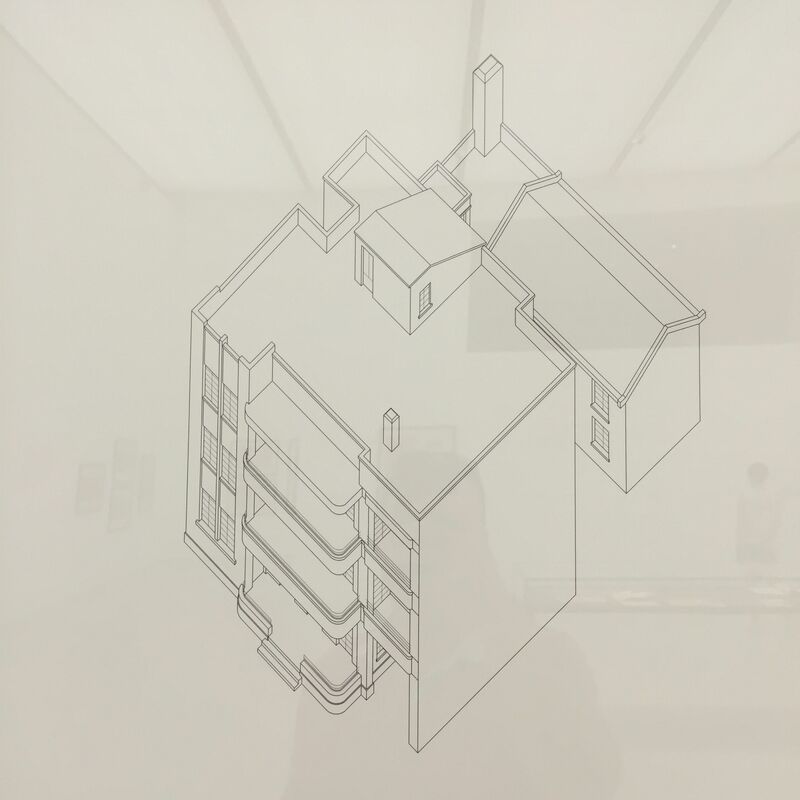 I thought the design looked familiar, but did not really knew from where until seeing the rendering. 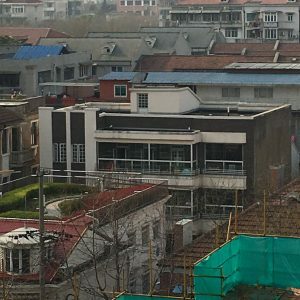 The Yan Mansion designed by Poy Gum Lee and built in 1934, is actually the house I saw from the rooftop. 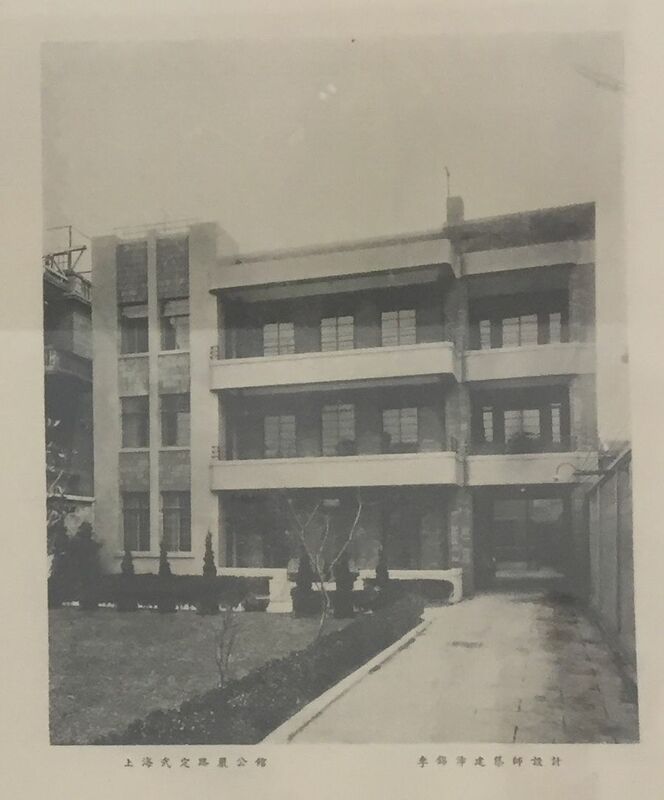 This was further confirmed by an old picture, although original balconies have been glassed over and the ornamental doors and windows are long gone. Lastly, a map of the location was provided showing it located on “Wuting Road”, today’s Wuding lu. 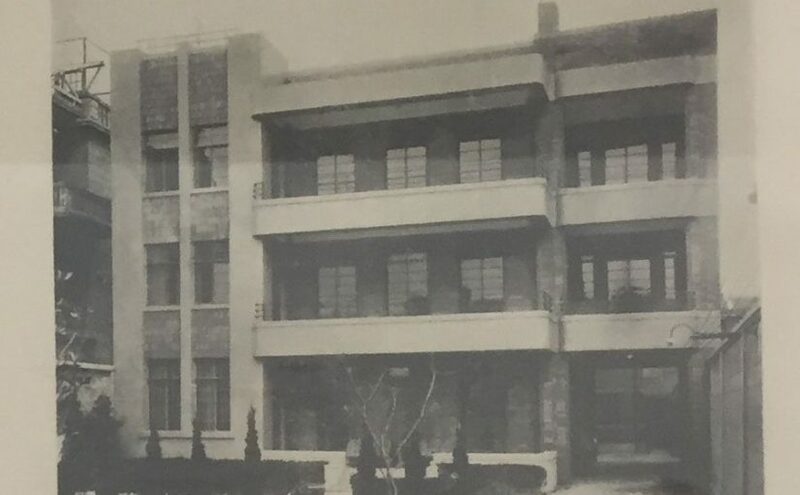 Although there is no historic plate on the building, it is without a doubt, the Yan Mansion designed by Poy Gum Lee, located on today’s 932 Wuding lu. Unfortunately, most of the garden has been eaten by a new building masking it from the street. Being a school also makes it off limits for most people. 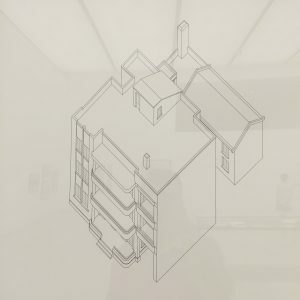 Funny enough, the exhibition showed its blue print but did not show any current picture, nor mentioned that the building still stands. Hopefully, one day it will be recognized and protected. In the meantime, its current use should keep it standing for long.